Bollywoo: 10 Must See Bollywood Films! 10 Must See Bollywood Films! 10. DILWALE DULHANIA LE JAYENGE (1995) - The most loved romantic film in the history of Indian cinema deserves to be on this list just for that reason alone, but thankfully it's not the only reason. At the time of it's release Kajol and Shahrukh Khan were virtual unknowns. It was a time when films succeeded based on content and not star power. Most of the 20 somethings of today are probably too young remember the era when the film was released, but in 1995 Dilwale Dulhania Le Jayenge was the highest grossing film of the year and went on to break the record for highest grossing bollywood film. Shahrukh Khan and Kajol would emerge as one of the most beloved on-screen pairs for the next 15 years. Every film they have done together has been a box office success internationally (By every film I mean films in which they were both the lead and not movies where they may have had a guest appearance). 09. 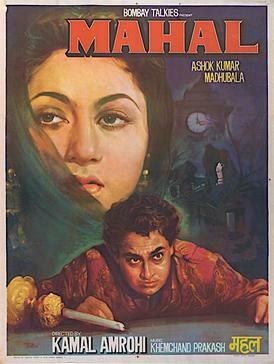 MAHAL (1949) - The directorial debut of Kamal Amrohi proved to be a big smash. Starring Ashok Kumar and Madhubala it was a groundbreaking supernatural suspense thriller and the first (and possibly the best) Bollywood film to deal with reincarnation. The hugely popular song Aayega Aanewala, sung by Lata Mangeshkar (one of her first major hits), was used beautifully throughout the film. Believe it or not legendary Bimal Roy was actually one of the editors of Mahal. With talent like this it was obvious Bollywood was headed in the right direction. 08. PYAASA (1957) - In 2005, Time Magazine rated Guru Dutt's Pyaasa as one of the top 100 films of all time. In 2011, Time magazine declared it as one of the top 10 romantic movies of all time. Waheeda Rehman finally got her big break in Bollywood and after Pyaasa there was no turning back for her. Everything about this film is so well done that I don't know anyone who doesn't like it. From the songs to cinematography to direction to action to story and lyrics, etc. etc. Starting with the first scene where Guru Dutt is laying next to a lake right through to the last scene you're engaged in the story completely. It's poetry in motion. 07. READY (2011) - I have watched Ready at least 10 times and it still entertains me, any film that can do that must be special. Not only does it have a good star cast but their on-screen chemistry takes this movie to another level. Everyone has played their role according to what the character is and no one has gone over the top - as they tend to do in Bollywood movies. The story is simple and what unfolds is a hilarious romantic comedy that forces you to say... it was worth every paisa and then some. 06. 3 IDIOTS (2009) - At the time of this post 3 Idiots was still the highest grossing Bollywood film ever. A title I'm sure all its fans will agree it deserves. At 44 years of age Aamir Khan was playing an 18 year old college student and he pulled it off with uncanny charm, grace and panache. It's not too difficult for an actor to play an 80 year old man when he's in his 20s, 30s, 40s or 50s, but the true talent of any actor is visible when he can do what Aamir Khan did in 3 Idiots, i.e., play a younger character especially one who is less than half his age without prosthetic makeup. 05. MUGHAL-E-AZAM (1960) - The most expensive Bollywood film of its time, it became the highest grossing Indian film soon after its release (breaking the record set by Mother India in 1957) and held the title for 15 years until it was broken by the #2 movie on this list in 1975. It took 9 years to complete Mughal-E-Azam but the end result speaks for itself. It also set the record for the highest distribution fee received by any Bollywood film at that time. Released in 150 theatres it was the widest cinematic release for a Bollywood film until then. In 2004, It was the first film to be fully restored in colour for a theatrical release and again achieved commercial success when it was released. 04. CHUPKE CHUPKE (1975) - Possibly the funniest Bollywood film ever made, with an all-star cast which showcases what on-screen chemistry and timing are all about. Each character is so well etched that they remain in your memory long after the film is over. The dialogue leave you wanting more and you find yourself repeating it out loud. Brilliantly written, directed and acted, I highly recommend this film to anyone who hasn't seen it. Once in a while you get a film which truly deserves the title of classic, Chupke Chupke is that diamond in the rough. 03. 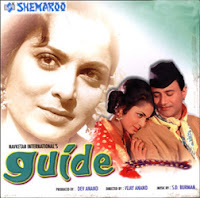 GUIDE (1965) - Based on the critically acclaimed novel, The Guide, by one of India's greatest English language novelists, R. K. Narayan, is highly regarded as one of the masterpieces of Bollywood. The song Piya Toh Se from Guide is probably my favourite Hindi song in terms of composition. There are several other films on this list which I would put ahead of Guide as my favourite, but this list is about must see movies not favourites and thus Guide is at number three because it's an essential film for any lover of the craft. 02. SHOLAY (1975) - No list is complete without this film. If you haven't seen it yet you're one of the few Indians who hasn't and I suggest you run not walk to the nearest store to get a copy. 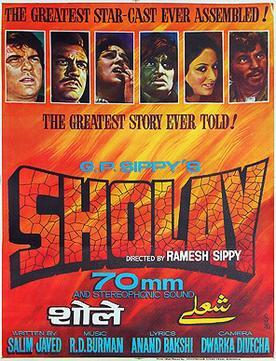 Sholay broke the highest grossing film record when it was first released, a record held for 15 years by Mughal-E-Azam and was held by Sholay for almost 20 years. 1975 might have been the greatest year Bollywood has ever had in terms of content and Sholay led the way. Although it had a poor start, it picked up from the 3rd week onwards - thanks to word of mouth - and was the first Indian film to celebrate a silver jubilee (25 consecutive weeks) at more than 100 cinemas across India. 01. KAAGAZ KE PHOOL (1959) - Actor/Director/Producer Guru Dutt gave his heart and soul to the making of this film. Although it was a major flop when it was first released - and discouraged Guru Dutt from ever directing again - today, it is considered amongst one of the best films to come out of India. Guru Dutt was one of the few directors who was ahead of his time and that's especially visible in Kaagaz Ke Phool arguably his greatest film. Guru Dutt was a master when it came to lighting a black and white film Kaagaz Ke Phool is worth watching for a lesson in cinematography and lighting techiniques alone. How one wishes this film was a hit because we truly missed out on what other wonderful films the multi-talented Guru Dutt would've directed for us had this one been a success. Thank you so much for your wonderful words. It always pleases me when I hear that my readers are enjoying my posts and it inspires me as I continue to write. Ek Tha Tiger Week 3 and 4 Collections!